As President, I am honored and thrilled to be a part of this fast-growing organization, which embodies the core values of enhancing and promoting the leadership role of women in the optical industry. The OWA is attracting women leaders who have diverse experience in and passion for our industry. Together we will do great things! We started our 21st year in New York City at Vision Expo East, with two fabulous "Star Awards" events. The Champagne breakfast and Award Ceremony recognized three extraordinary women for their steadfast leadership, determination, and contributions to our Industry: Pleiades Honoree Ashley Mills, CEO of The Vision Council, Pyxis Honoree Deb Bulken, Director of Sales of Luxottica, and, Emerging Leader Honoree Janelle Pauli, Sr. Marketing Manager of VisionWeb. At Vision Expo West in Las Vegas, we had the greatest attendance of any OWA event to date. 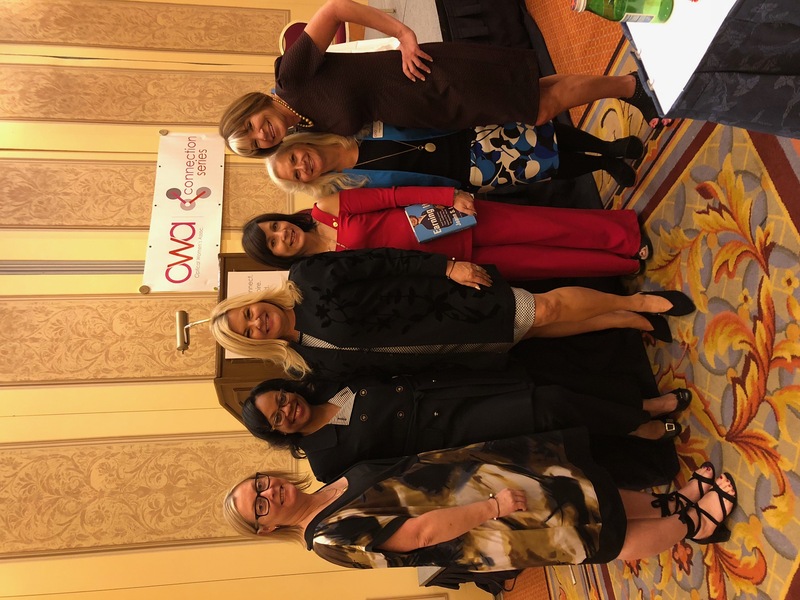 The OWA Connection Series luncheon was an interactive chat with author of Earning It, Joann Lublin. The event was streamed live on Facebook to reach our remote members, so that they, too, might be connected. The conversation was led by Erinn Morgan, Editor-in-Chief at Eyecare Business magazine, member of the OWA Board of Directors, and chair of The OWA Communications Committee. Lublin held the audience rapt with her stories and creative visual presentation. Lublin's hard work — and that of the women she wrote of — truly inspired the audience. They surely will pave the way for the next generation of passionate career-driven women. Friday night, the OWA hosted its annual fundraiser, the Networking Reception and Raffle Event, which this year also featured an online auction. The raffle and auction items totaled more than $35,000, all donated by our sponsor companies and individual contributors. Thank you, everyone, for your generosity; you assisted the OWA in exceeding our fundraising expectations! The evening was full of excitement as I announced our new Regional Events team led by the Membership Committee Vice Co-Chairs Jan Cory, an independent consultant, and Stacey Curcio, Regional VP at VSP. Together with their team they have contributed to the continued growth of the organization. I also had the privilege of recognizing the OWA 2018 Board of Directors. They are true visionaries and with their dedication, direction, and passion we will continue to "Connect-Inspire-Lead" the women in optical. A special thank-you to our member volunteers whose hard work contributed to the success of our events. I have dedicated my career to our industry; first as an optician and then in sales for over 25 years. I am the Southwest Regional Sales Manager at the newly formed Thélios company. My entrepreneurial spirit drives me. I am always looking ahead and planning for the future. I reside in Southern California with my husband Scott and our two wonderful sons, Christopher and Cole. Serving as President of the OWA is such a thrill, and also the most humbling experience. I am excited to be working alongside such talented, dynamic women leaders! "I can do things that you can't do, you can do things that I can't do: Together we can do great things!" Greater things ahead for the OWA! 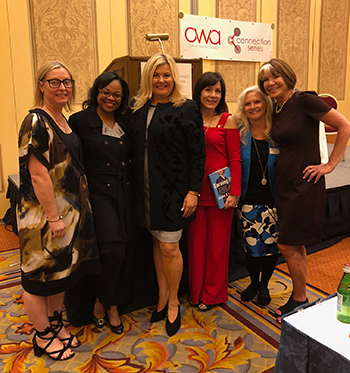 Joann S. Lublin, long-time career columnist for The Wall Street Journal and author of Earning It: Hard-Won Lessons from Trailblazing Women at the Top of the Business World, shared her career advice during the OWA Connection Series Event, held at Vision Expo West and sponsored by ABB Optical. Here are 5 key takeaways from this popular, well-attended event. The OWA packed the room at its annual Networking and Raffle fundraiser event, held on Friday, Sept. 28, during Vision Expo West. A record-breaking crowd enjoyed good food, drink, and camaraderie, but the stars of the evening were the more than $35,000 in goods that were donated for the annual raffle and first-time online auction. 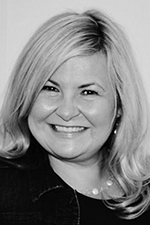 "We can impact powerful, positive change through our connections with other people", says Holly Rush, CEO of Costa Del Mar and the energy behind the #DoMore movement the Optical Women's Association launched earlier this year. "Timing is everything," says Rush, "and the awareness that's been created in the world around us today on diversity, inclusion, and women's rights in the workplace means Our Time is Now." Here, Rush shares with the OWA what she hopes others take away from the #DoMore message. Were you aware that some amazing OWA members have been featured in Optometric Management magazine throughout 2018? OWA members have written articles on all aspects of work from a women's perspective. Topics ranged from work/life balance to optometric practice owner profiles. The OWA is fortunate to have members with a wide breadth of knowledge, and this has been a wonderful opportunity to shine the spotlight on a few of them. Check out some of the recent articles. The OWA membership continues to grow! We are happy to welcome these 98 new members since the April 2018 newsletter. To join, visit our website or mail a check to Optical Women's Association for $125 with your name, company name, address, email address, phone, and fax numbers. Note: if more than one person in your company joins, membership is only $95 per person.